Authentic Lucky Ball Roulette - A video review by LiveCasinoComparer. Authentic Lucky Ball Roulette is normal European Roulette with the addition of a side bet called “Lucky Ball”. 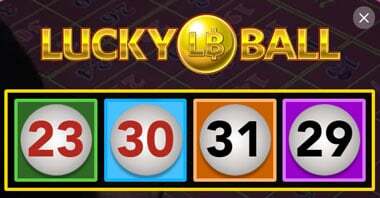 “Lucky Ball” was developed by GES Ltd and Authentic Gaming has an exclusive license to use it on live casino Roulette. The side bet is available in Land Based casinos and is distributed by TCXJohnHuxley. Authentic Gamings Lucky Ball Roulette is streamed from the tables at the Casino International in Georgia, by the Black Sea. The table used is the same as Authentic Turbo Roulette, the only difference is the playing interface that displays the Lucky Ball Betting options. Streamed live from the casino floor at the Casino International in Georgia. The Lucky Ball Side Bet can pay up to 120:1. 4 numbers are randomly selected at the beginning of each game by computer. It’s the only part of the game that uses an RNG (Random Number Generator). The rest of the game is all Live. The 4 numbers are the base numbers and you can place money on them on the special area on the betting grid. After betting time has completed one of the numbers is selected to be the Bonus Number, which comes with an enhanced payout. Green Number pays 6:1. As a bonus it pays 120:1. Blue Number pays 12:1. As a bonus it pays 100:1. Orange Number pays 20:1. As a bonus it pays 75:1. Purple Number pays 25:1. As a bonus it pays 60:1. As you can see in the example above, the Bonus Number was 30, but the result came in as number 10. You can if you want just play the side bet, by placing one or more chips on the side bet area on the betting grid. If your number comes in you’ll win the payout and if it’s the bonus then you’ll get the enhanced payout. Unfortunately you don’t know which is the Bonus Number until after betting time has completed, so to guarantee that you get the Bonus you really have to bet on all 4 numbers. I consider the side bet as a bit of fun. The real money is made from your normal bets on the table. I use only a small proportion of my bankroll to feed the side bets, so If I’m making a 32 chip bet on the main table I’ll bet one chip on each side bet number. Betting time is not consistent and is influenced by how busy the table is in the Casino and how much work the dealer has to do in paying out the punters at the table. I would say on average it’s about 90 seconds, but it can be as much as 5 minutes! Each of the side bets has a different House Edge, so it’s worth knowing these before making a wager. The Lucky Ball Roulette side bet is a bit of fun. I’m surprised at how many people I see playing it in land based casinos, given it’s RTP. Still if you enjoy the thrill of a gamble then why not. You’ll probably want to adjust the sound volume of the Lucky Ball selector. It becomes very irritating, fortunately there’s a setting where you can reduce the volume or switch it off completely. The sound reminds me of an old Cash Register I used in a Newsagents where I worked many years ago. If you fancy trying out Authentic Lucky Ball Roulette you’ll find it at a couple of the casinos below. It’s an optional addition to the table which each casino has to pay extra for, which is why not every casino has it.